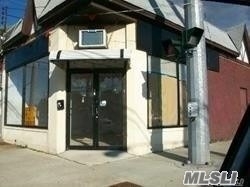 The Good Size Property Is Centrally Located For Retail Business And Provides Great Exposure. Very Busy Corner Location On Hillside Ave. A Well Trafficed Road In Central Nassau & Surrounded By International Retail Stores, Such As Dunkin Donuts, Carvel, Wendy'S. It Is Near The Williston Park Line Of Lirr. The Most Desirable Line In Long Island.